William Randolph Hearst knew how he wanted to live from the age of ten when he was taken on the grand tour of Europe in 1873. The castles and country estates he saw during that trip were the inspiration that fueled his later achievements. As an adult, he evolved into a brilliant visionary whose accomplishments spanned magazine and newspaper publishing, movie newsreels and radio. Now remembered more for his over-the-top real estate holdings than his business acumen, he owned two of the most fabulous properties in the United States: Hearst Castle in San Simeon, California and the Beverly House in Beverly Hills where he lived with actress Marion Davies. 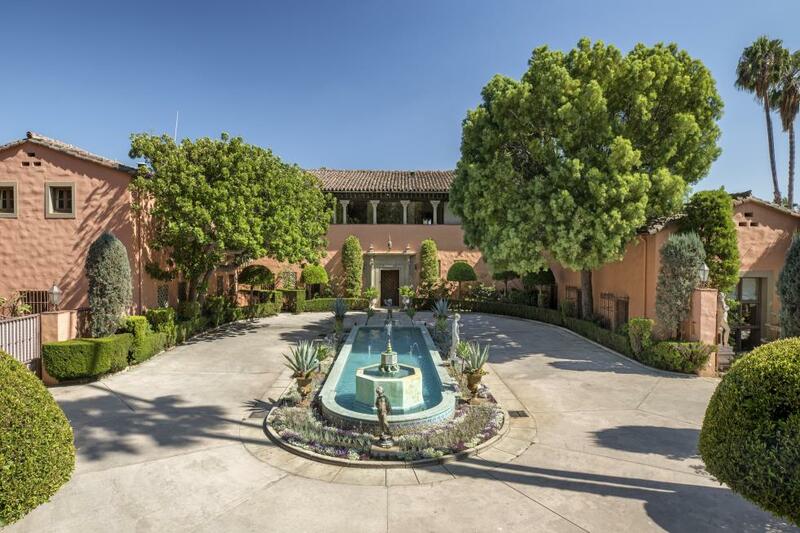 The Beverly House estate is now for sale priced at $135 million. Well known for its memorable movie scenes in “The Godfather,” where the uncooperative movie producer Jack Woltz woke up to a horse head in his bed, and the glamorous estate where Whitney Houston’s character lived in “The Bodyguard,” Beverly House was a favorite of the Kennedy family where John and Jackie spent part of their honeymoon and later the West Coast presidential election headquarters for JFK’s 1960 presidential campaign. Designed in 1927 by Gordon Kaufmann, the architect who did the Hoover Dam, Hollywood Palladium, Los Angeles Times building and the Santa Anita Racetrack, Beverly House is the quintessential emblem of Hollywood’s Golden Era. The estate is well known for its H-form architecture characterized by long colonnades, wide balconies, arched floor-to-ceiling windows and its spaciousness. Some of the spaces include a stunning two-story library with hand-carved paneling and a wraparound walkway; a formal living room with its 22-foot-high, hand-painted, arched ceiling; a state-of-the-art spa; a billiards room with herringbone parquet floors and an intricately designed ceiling and carved fireplace – both from the Hearst Castle in San Simeon. The grand upstairs hallway is more than 102 feet long and features a 40-foot wide, nearly 9-foot-tall Dennis Abbe mural that was commissioned by Hugh Hefner. The gardens, designed by landscape architect Paul Thiene, are a focal point including cascading waterfalls to the pool. Located only three blocks from Sunset Boulevard and the Beverly Hills Hotel, Beverly House is sited on 3.5 acres at the end of an 800-foot-long driveway with 19 bedrooms, 29 baths, a near Olympic-size swimming pool, lighted tennis court, two projection/screening rooms, a commercial grade kitchen, terraces to accommodate 400 or more guests for a seated dinner and grounds to accommodate more than 1,000 people. Set on its own promontory, Beverly House consists of approximately 50,000 square feet and in excess of 35,000 square feet of living space while guaranteeing extreme privacy and security behind its guard, house-gated walls. Built in the late 1940s, the Philip Johnson Glass House, now a museum and listed in the U.S. National Register of Historic Places, has been the design star of New Canaan, Connecticut and put the town firmly on the map of outstanding architectural history. Though Johnson built the Glass House as his personal residence, he built another house nearby called the Alice Ball house where he later decided to live and use the Glass House strictly for entertaining. In 2015, architect Reja Bakh purchased Johnson’s more livable Alice Ball House on 2.2 acres for $2.3 million and has designed a new residence which will combine the historical home within a compound which will be visually complementary to both homes. He is now selling the Alice Ball House along with plans for the new home showcasing a sleek contemporary in its renderings for $7.7 million. Johnson, who died in 2005, was one of the famed Harvard Five which included Johnson, John Johansen, Marcel Breuer, Landis Gores and Eliot Noyes. With all the exuberance of youth and filled with new ideas, the group settled in New Canaan and, along with other modern notables such as Frank Lloyd Wright, brought architectural style from the frilly, gingerbread, overdesigned and overstuffed Victorian into the sharp-edged, clean-line, minimalist style. Instead of homes that emphasized privacy, the new modern was open to the outdoors, views and patios with visually vanishing thresholds. Though Johnson intended to live in his glass house, by 1953 he realized that he actually did need a modicum of privacy and built the Alice Ball house. Bakh, with his admiration for the forerunners of the modern style, purchased the Alice Ball house as a weekend retreat. After staying there and mulling how to optimize the property to its fullest, he painstakingly drew up a plan for a new house that would incorporate the existing Alice Ball design through a series of walls – some connected and some appearing to be free floating. He is now offering his creation to a buyer with a similar appreciation of modern architectural history. As drawn with renderings, the incorporation of the new and old structures would provide a large open living area, three bedrooms which number could be customized to family requirements, an indoor pool and spa, a large underground collectible car garage with natural light from skylights and a wine cellar. The 1,500-square-foot Alice Ball House could be repurposed as a gallery. An opportunity to own a piece of modern architectural history plus owner-architect Reja Bakh’s plans for expansion, renamed ‘The Wall House,’ priced at $7.7 million. Co-listing agents are Toni-Ann Vittoria and Inger Stringfellow of William Pitt Sotheby’s International Realty, New Canaan, Connecticut.